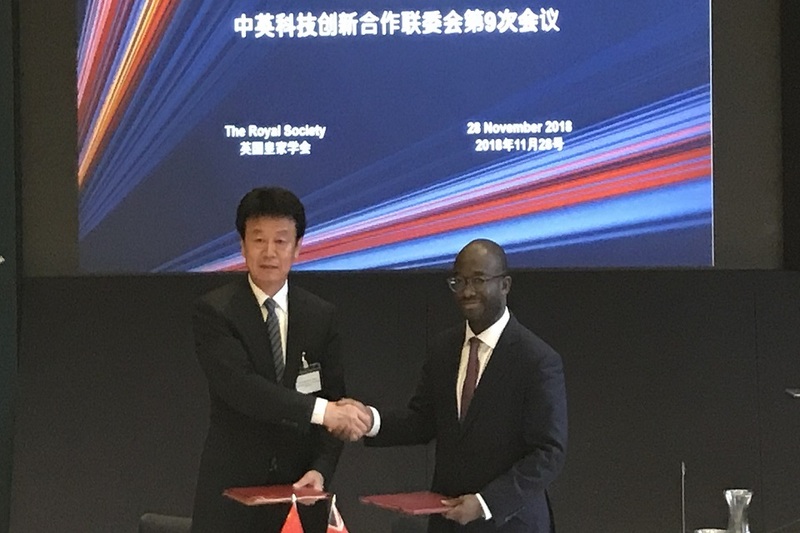 Science Minister Sam Gyimah and Chinese Vice-Minister Zhang Jianguo meet in London for Joint Science Commission, reaffirming strong partnership in science and innovation. 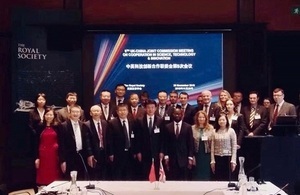 UK and Chinese ministers celebrate 40th anniversary of scientific relations. On 28 November, the 9th biennial UK-China Joint Commission on Cooperation in Science, Technology and Innovation brought a delegation of senior Chinese officials to London led by the Vice-Minister of Science and Technology, Zhang Jianguo. Meeting with the Minister of State for Universities, Science, Research and Innovation Sam Gyimah, UK government and academic leaders, they jointly celebrated successes to date and mapped out collaboration for the coming years. The UK and China are established science and innovation partners, November 2018 marks four decades since the first bilateral scientific treaty was signed between the UK and China. Science and research knows no borders, and our researchers have a successful collaborative history with China, pooling expertise and pushing the boundaries of knowledge. Through our modern Industrial Strategy we are making the most of our international partnerships around the world. I look forward to the breakthroughs we uncover together with China in the future as we continue building ties between our countries and supporting our innovative economies. UK Science Minister Sam Gyimah met with Chinese Vice Minister for Science and Technology Zhang Jianguo to discuss ongoing collaborations and agreed on the next joint Flagship Challenge, developing science & technology to support healthy ageing. At the meeting they reviewed the relationship since the last Joint Commission was held, and progress of the UK-China Joint Strategy for Science, Technology and Innovation Cooperation. Signed last December in London during the People to People Dialogue, this is the first bilateral science and innovation strategy China has developed with another country and a central part of the UK-China relationship. Under the joint strategy the two countries have launched the Flagship Challenge Programme which tackles the challenges resulting from global issues such as climate change, population growth, environmental pollution, and decreasing natural resources. The inaugural Flagship Challenge Programme focuses on agricultural technologies and SmartFarm is the first project to launch under this area. Led by Agri-EPI, one of the UK’s 4 Agri-Tech Centres, it aims to transform food production, enabled by smart technologies for increased yields, reduced usage of chemicals and improved food quality. Healthy ageing was agreed to be the priority area of the Flagship Challenge for 2019. Impacts from co-funded UK-China projects were shared at the meeting with the screening of the UKRI China: Inspiring Partnerships video documentary, released earlier this month during the UK Research and Innovation (UKRI) China launch. UKRI also announced yesterday funding for two joint programmes with the National Natural Science Foundation of China (NSFC). £8 million and 36 million RMB has been agreed to fund four new interdisciplinary Partnerships Hubs to tackle the global challenge of Antimicrobial Resistance. EPSRC are investing £3.2 million with 12 million RMB from NSFC to study decarbonisation in manufacturing, this is the third competition in the Low Carbon Innovation series. Since the last UK-China Joint Commission, UKRI has delivered eight bilateral and four multilateral research and innovation programmes with national partner funders in China. We have also co-funded collaborative R&D projects tackling industrial challenges with Guangdong, Jiangsu, and Shanghai. Building on strong foundations of our work in China over the past decade supported by our UKRI China office, these programmes will continue to catalyse the individual strengths of the UK and China to bring mutual benefits and achieve global impact. Adding to collaboration in agri-tech, UKRI and the Chinese Ministry of Science and Technology are funding 9 new projects worth £16m under the UK-China Research and Innovation Partnership Fund. These bring together UK and Chinese academia and businesses to address China’s agricultural challenges; for example novel rice processing, management of agricultural waste, and smart systems to manage poultry farms. The UK Science and Innovation Network has bases in over 40 countries and works to facilitate international science and innovation collaboration with the UK. Our team in China is based in the British Embassy Beijing and the British Consulates General in Shanghai, Guangzhou and Chongqing. We focus on sectors where UK and China priorities overlap, and which are important for tackling global challenges, including: agri-tech, clean energy, life sciences, future manufacturing, space and satellite technology, digital economy and future cities. The UK-China Research and Innovation Partnership Fund, part of the UK’s Newton Fund, brings together the best of UK and Chinese expertise to tackle and build capacity to respond to global challenges. So far more than 826 partnerships have been funded, including: understanding climate risk and supporting climate smart decision making, tackling antimicrobial resistance, innovative technology to support agriculture, and programmes to develop researcher skills and knowledge. The Newton Fund is part of the UK’s official development assistance (ODA) commitment, administered in the UK by the Department for Business, Energy and Industrial Strategy (BEIS). UK Research and Innovation China is one of four international offices providing in-country representation for UK Research and Innovation, the UK’s principal public body funding research and development. UKRI has an annual budget of more than £6bn, which will increase as the UK raises national R&D spending to 2.4 percent of GDP by 2027. UK Research and Innovation China plays a key role in securing longstanding partnerships with China to support a Global Britain. Since 2007, our office has facilitated joint research and development programmes with China representing 257 individual grants with a total combined investment value of over £275m involving more than 200 partner institutions and businesses.